After a three-year hiatus (also known as law school), Rakesh was excited to return to Virginia Mock Trial as an assistant coach in the fall of 2010. Originally from Cleveland, OH, Rakesh was planning to become an engineer before participating in a mandatory mock trial of Brutus and Cassius in ninth grade English. From that point on, Rakesh was hooked on mock trial. While attending Columbia University, Rakesh competed for four years on the mock trial team. 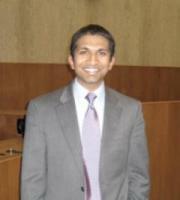 At Columbia, Rakesh won three All-American attorney awards and competed in the national championship trial. After graduating, Rakesh became an Assistant Coach of VaMT while working as a paralegal in the Department of Justice. One year later, Rakesh enrolled in Stanford Law School. Having made the difficult decision to move to the west coast, Rakesh decided to ease his transition by returning to the activity that had consumed his life thus far. Rakesh helped lead Stanford's law school mock trial team to a runner-up finish at the 2010 TYLA National Championship Tournament and was named the best overall advocate in the tournament. (This cemented Rakesh's career trend of finishing no better than second place in non-VaMT mock trial events.) Rakesh also competed in moot court in law school, teaming up with fellow assistant coach Sam Bateman to win Stanford's intramural competition as well as the National Criminal Procedure Tournament. Rakesh returned to Charlottesville in 2010-11 to clerk for Judge J. Harvie Wilkinson III of the United States Court of Appeals for the Fourth Circuit (and, of course, to coach UVaMT) and then clerked for Associate Justice Elena Kagan of the Supreme Court of the United States. He currently works as a lawyer in Washington, DC.